Fresh off picking up his Carolina League Championship ring Friday night, Norris came up to the plate with the bases loaded and the game on the line Saturday afternoon. Norris took an 0-2 fastball from the Yankees’ Turpen and unloaded for a monster shot that many thought was out of Space Coast Stadium. His ground rule double (ruled a single by the official scorer, as that was all that was necessary to finish the game) bounced over the wall and Norris was mobbed by his teammates. It was wonderful to see Manager Jim Riggleman give Norris the nod today, especially to replace Roger Bernadina, who had a terrible day at 0-4, 3K and an error in center. Center field is where the Nationals are most insecure this Spring, and with Werth and Morse locks for the corner slots, that leaves Nyjer Morgan, Rick Ankiel and Roger Bernadina fighting for the starting slot. Morgan has been sullen and frustrated (he flipped off a fan that was just saying hello on Friday afternoon), while Bernadina has had plate struggles, and Ankiel has had defensive setbacks. It’s hard to see the position as anything but an albatross for the club right now. John Lannan struggled through 4 1/3 innings today, giving up four runs on as many hits, walking three and striking out three. It was disappointing to see him regress from the end of last season, when it seemed that he had everything under control again. Yunesky Maya pitched four solid innings giving up just a single unearned run (off Bernadina’s error, in the sixth) and largely kept the Yankees’ weak road squad from doing much of anything. To end his day, he fought an eleven pitch at-bat against prospect Austin Romine, who just would not accept his fate, fouling off pitch after pitch before popping out foul down the left field line. At the end of the afternoon, it was Bryce Harper that was on the chopping block, along with Atahualpa Severino, Ryan Mattheus, and Tim Wood, all of whom are bound for minor-league camp. 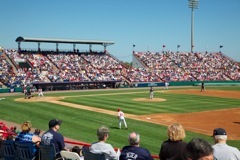 Harper had a pretty strong debut, and made the case to Riggleman that he might benefit from more time with coaches Bo Porter and Rick Eckstein, but the team wants him playing, and starting, every day, instead of just acting in the late innings, so he was optioned to Hagerstown where he’ll begin the 2011 season. Harper went 7 for 18 this spring with the big club, scoring 3 runs, and driving in 5. His triple slash was .389 / .450 / .556, which is pretty respectable for a kid who’s only barely old enough to vote. If you haven’t yet, please take the time to go read Dave Sheinin’s 5,000-word profile of Harper and his family, you won’t regret it. This is a kid that’s going places, and I’d not be surprised to see him spend part of September in Washington, if he continues to tear it up the way he started in Spring Training. The Nationals have some hard choices left to make, and though it appears the starting rotation is fairly well set at Hernandez, Zimmermann, Marquis, Lannan and Gorzelanny, there are bullpen calls left to be made, and the team will have to figure out who’s staying with the ballclub in the outfield (look for Morgan to perhaps start the year in a Chiefs cap, as he has an option remaining), who will handle duties behind the plate (Jesus Flores is making his case at the plate, while Ramos is making his behind it) and which of the bench players will make the 25-man roster. They have 17 days before the close of camp, and that’s plenty of at-bats.